Any stainless stool contains 13% or higher chromium. Because of the large amount of chromium, stainless steels are kept tree from corrosion due to the chromium oxide forming a rigid membrane on their surfaces when subjected to such corrosive media as air or oxidizing acids (e.g. nitric acid). Austenitic stainless steel contains (in addition to chromium) nickel, molybdenum, and copper to provide the corrosion resistance against non-oxidizing acids (such as hydrochloric and sulfuric acid) and reducing acids (such as saline solution and sulfurous acid). The typical austenitic stainless steel, Type 304 (l8%Cr-8%Ni), is used for a wide range of applications due to excellent mechanical properties, workability, weldability, in addition to superior corrosion resistance. However, the weld heat-affected zone of Type 304 may be attacked by selective corrosion, when it is exposed to a severe corrosive environment. The attack is called "weld decay," which is caused by intergranular corrosion. Fig. 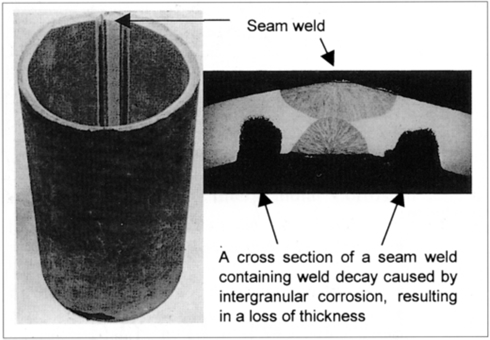 1 shows weld decay that occurred on both sides of the seam weld of a 304 pipe of a hot dilute nitric process. 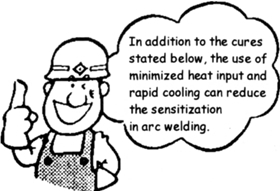 Weld areas are heated at high temperatures in arc welding. Fig. 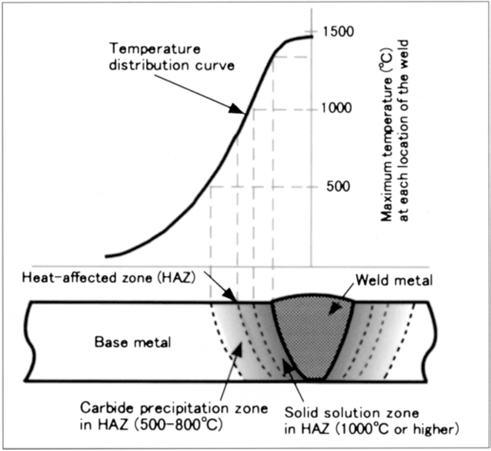 2 shows the temperature distribution and the heat-affected zone in a weld. (1) 304L or 316L grade, because lower carbon content decreases the carbide precipitation. (2) 347 or 321 stabilized grade, because stronger carbide-forming elements (Nb or Ti) prevent the precipitation of chromium carbides. (3) postweld solution annealing treatment in the temperature range of 1000-1150°C, followed by rapid cooling, which decomposes the chromium carbides and make the chromium resistible to corrosion.